In a year where £840million ($1.1billion) of cryptocurrency has already been stolen, Express.co.uk exclusively reveals how best to keep to keep your crypto safe. Cryptocurrency such as bitcoin is an entirely digital entity requiring an internet connection for any transaction. 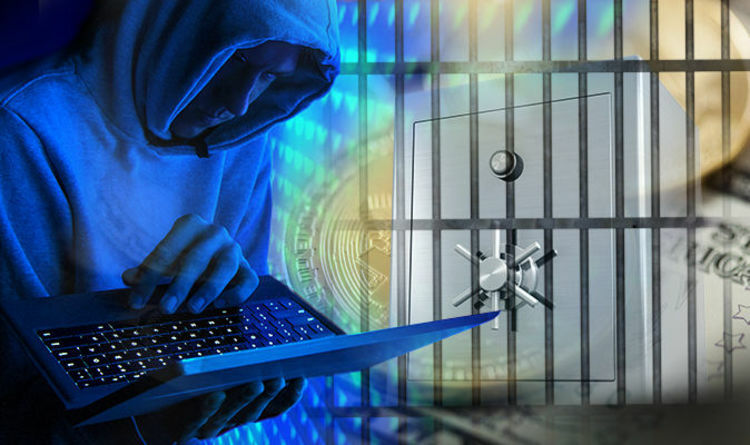 According to Steven Russo, founder of digital security company Krypti, this connectedness makes bitcoin increasingly susceptible to hacking. Mr Russo exclusively told Express.co.uk: “Blockchain itself is safe, but there are two vulnerabilities: the storage of keys and the transaction and use of the keys. Bitcoin wallet keys are the most susceptible to theft because they give users access to their cryptocurrencies. The latest in a string of brazen thefts saw £46million ($60million) of digital coins plundered from a Japanese exchange. And in January 2018, more than 660,000 crypto wallets were stolen from exchange service BlackWallet, costing crypto owners hundreds of thousands of pounds in losses. Mr Russo also outlined the second major vulnerability with cryptocurrency, which concerns the transaction and use of cryptocurrency keys. He said: “If you wanted to send me some cryptocurrency, whether you are inside or outside an exchange, you would have to type in literally about a 30 digit number, which represents your crypto coin and my address. The crypto security expert said trusted crypto wallets enable users to send and receive digital currency, as well as monitor their balance. He added moving money is always a “big vulnerability”. In order to best protect your bitcoin and other crypto assets, you should invest in a physical crypto wallet – a hardware device similar to a USB pen-drive. Hardware wallets are an incredibly popular method of storing your tokens and are key to making transactions. These crypto wallets are password protected and come with a private key that only you should know. You can also opt for an online cryptocurrency wallet from a reputable source. Much like hardware wallets, online storage services will give you a private key to keep your digital tokens secure. Depending on which wallet type you choose, you can always transfer between the two. And always remember not to store you coins on a crypto exchange – once you buy or exchange bitcoin or any other cryptocurrency, immediately deposit it to your private wallet.